The Climb Badge is all about climbing out of your “modern cave” and going on an adventure. I like pink skies. Maybe you do too. There is but 1 level of the Climb Badge, in pinks and purples. Climbing mountains is hard. Heck, sometimes just getting out of bed is hard. But c’mon, climb out. Get stuff done. Live a life of fancy. Or something. 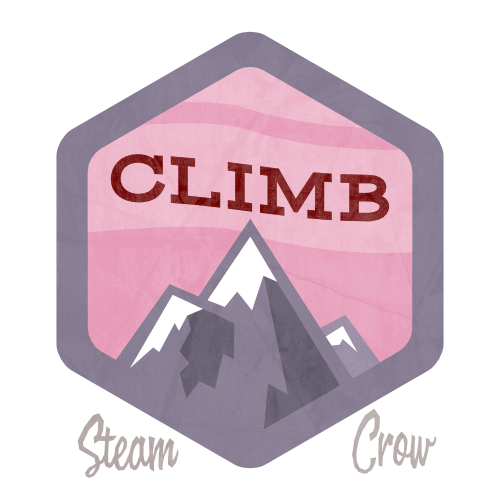 The Climb Badge is worth 10 Glory points. Mountains represent challenges and yadda yadda yadda. You already know that stuff. But what’s beneath those mountains? Dwarven gold? Black Dragons? World seeds? Defeat some personal demon… for just one hour or day or whatever you can manage. But try.